TORONTO – Fifteen families in the Greater Toronto Area will have safe, decent, and affordable housing, thanks in part to the Faith 150 Build. More than 30 leaders from a variety of religious backgrounds gathered at the Habitat for Humanity GTA east-end Toronto build-site at 140 Pinery Rd. today for a special day of volunteering for the construction. 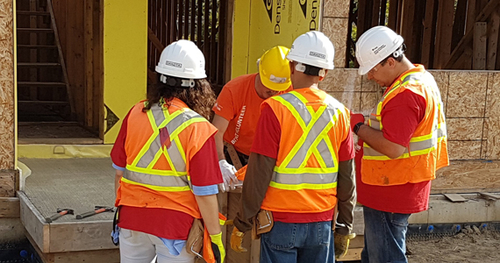 Faith in Canada 150 – a program of think tank Cardus – organized the effort in partnership with Habitat for Humanity GTA. Toronto’s faith communities won’t stop at one day of building by their leaders, however. Members of various faith communities will gather at the same site on October 25th to continue volunteering on the construction of the units. And on October 26th, a Women of Faith build is planned at 140 Pinery Rd. By 2019, the site’s stacked townhouses will become home to 50 working, low-income families. Habitat for Humanity GTA’s model of affordable homeownership provides a hand up for working, low-income families with the opportunity to become Habitat home owners. Habitat does not give away free homes – families pay an interest-free Habitat for Humanity mortgage geared to their income and volunteer 500 hours with Habitat for Humanity GTA on their build sites and ReStore. Habitat for Humanity Greater Toronto Area (GTA) is a non-profit housing organization that brings communities together to help working, low-income families build strength, stability and independence through affordable homeownership. With the support of donors and volunteers, Habitat GTA builds homes alongside partner families in Toronto Brampton, Caledon and York Region. Since 1988, Habitat GTA has built more than homes for more than 330 families, including over 1,000 children. Faith in Canada 150 is a program of Cardus that exists to celebrate the role of faith in our life together during Canada’s anniversary celebrations in 2017. For more than 450 years, faith has shaped the human landscape of Canada. It has shaped how we live our lives, how we see our neighbours, how we fulfill our social responsibilities, and how we imagine our life together. To learn more, visit: faithincanada150.ca and follow us on Twitter @FC150.